I love the indoor/ outdoor feel. Huge space, huge table for entertaining, simple style. Capitalise on the climateQueensland’s year-round warmth is envied by people across the globe. Make the most of it by using your verandah to best effect. 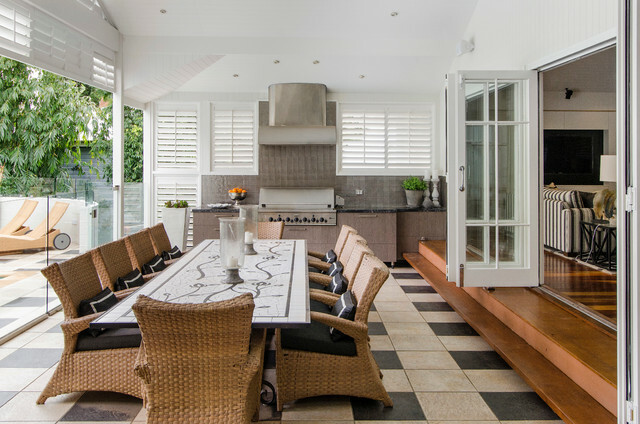 Add a stunning outdoor kitchen and a huge cane dining table and your guests will be content to settle in for the day – rain, hail or shine. Whitewashed plantation shutters allow you to take control of the elements, while bi-fold patio doors allow easy access inside.